Soul Taker Child Costume - Walk the dark night this Halloween in search of innocent souls. This Soul Taker Child Costume will have the spirits of evil surrounding you. 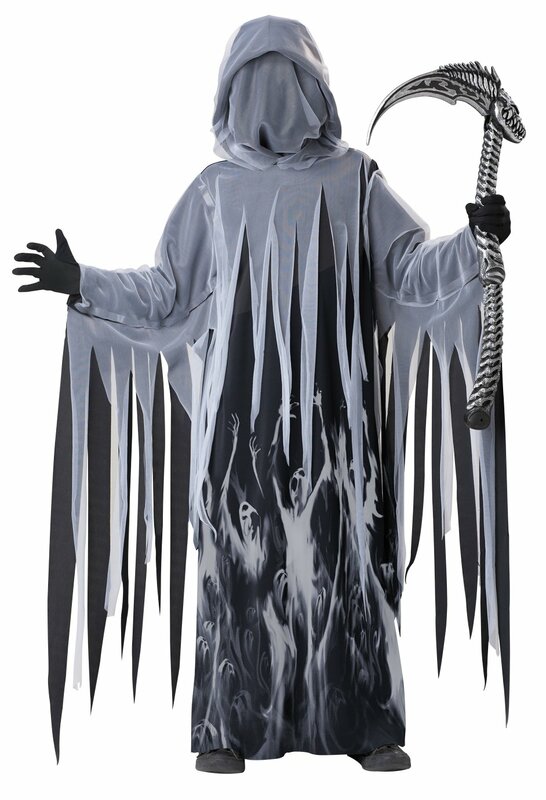 Our Soul Taker Costume features a robe with attached hood and face cover. Weapon not include and sold separately. International Shipments: Buyer is responsible for paying all customs duties and taxes associated with importing international shipments. For USPS First Class International shipping method, USPS does not provide tracking number or insurance. So, in the event that your package is lost or damaged during transit, we can not be held responsible for any claims. Please select Priority or Express Mail to have insurance and tracking information for your purchase. All estimated delivery time does not include any processing time clearing international customs department, which will vary for every country. Therefore, we can not gaurantee any delivery date for international shipments. Any delays from international customs or postal agencies are out of our control. Please contact your country's customs department or postal service to inquire about the average processing time and any potiential fees for importing goods.